Retailers: Does your shop accept used bike trade-ins? Read more about Retailers: Does your shop accept used bike trade-ins? Retailers, what do you think of mobile checkout at your store? We haven't thought about it/never heard of it. Read more about Retailers, what do you think of mobile checkout at your store? Retailers, how were your first-quarter sales compared to 2017? Read more about Retailers, how were your first-quarter sales compared to 2017? Retailers, have you see a resurgence in BMX in the last year or so? Read more about Retailers, have you see a resurgence in BMX in the last year or so? 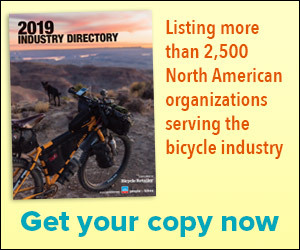 Do your customers care about bike brands and their affiliations with the NRA? Read more about Do your customers care about bike brands and their affiliations with the NRA? Do you offer basic bike service clinics in your store for customers to learn how to work on their bikes (i.e., flat fixing, chain lubing, etc.)? Read more about Do you offer basic bike service clinics in your store for customers to learn how to work on their bikes (i.e., flat fixing, chain lubing, etc.)? Retailers, where do you expect to see the most growth in 2018? Read more about Retailers, where do you expect to see the most growth in 2018? Is the government shutdown affecting your business in any way? Read more about Is the government shutdown affecting your business in any way? Would you support a bike tax in your state if proceeds went to bike projects? Read more about Would you support a bike tax in your state if proceeds went to bike projects? Read more about Are you optimistic about the 2018 speciality retail climate?